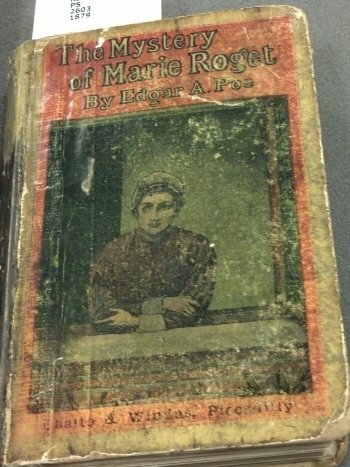 This yellowback version of The Mystery of Marie Roget and Other Tales was published by Chatto and Windus in June of 1879. Yellowback popularity peaked in the later half of the 19th century, but continued into the 1920s. Yellowbacks were single volume novels produced as a cheap way to entertain travelers during railway commutes. Train station bookstalls usually displayed yellowbacks for convenient purchase, but certain trains had their own supply. 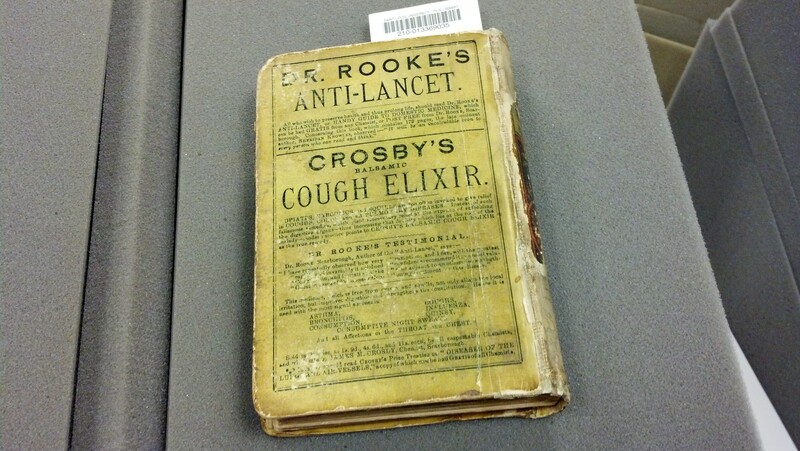 Yellowbacks were typically reprints of popular literature, but original material was printed in that form as well. Their genre ranged from light reading to non-fiction and classics and targeted everyone who traveled by train. 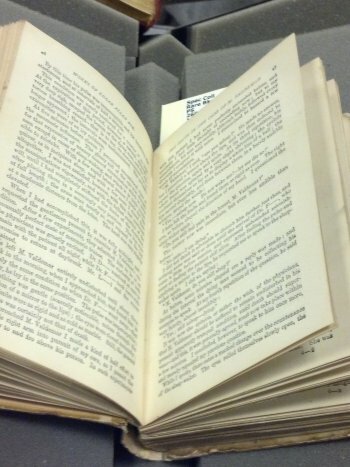 Yellowbacks were made by covering fiberboards with yellow glazed paper, making them easier and cheaper to produce than cloth-covered novels of that time period. 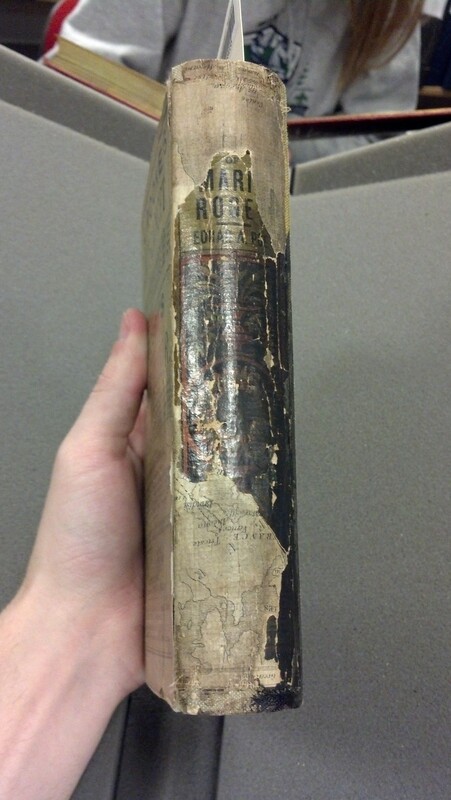 As The Mystery of Marie Roget and Other Tales shows, a colorful picture was placed on the front cover to entice the train passenger, and the rear cover contained advertisements to promote products and businesses. 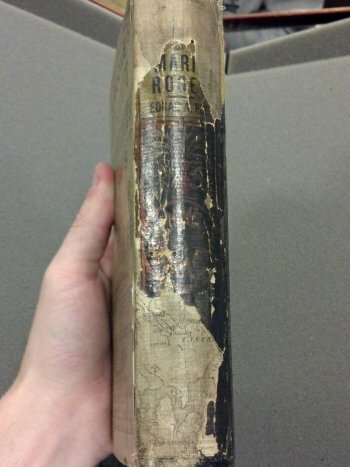 Even the binding contains illustrations to add to its visual appeal. In addition to exterior decor, this novel has interior propaganda for the publisher and other popular literary works of the time. 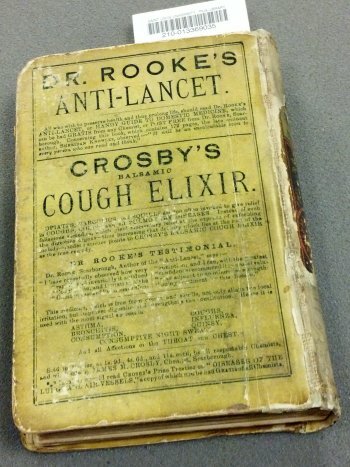 The advertisements yellowbacks contained lowered costs, making them more affordable for the general population. When yellowbacks were produced, they sold for about two shillings, one-third the cost of other books at the time. 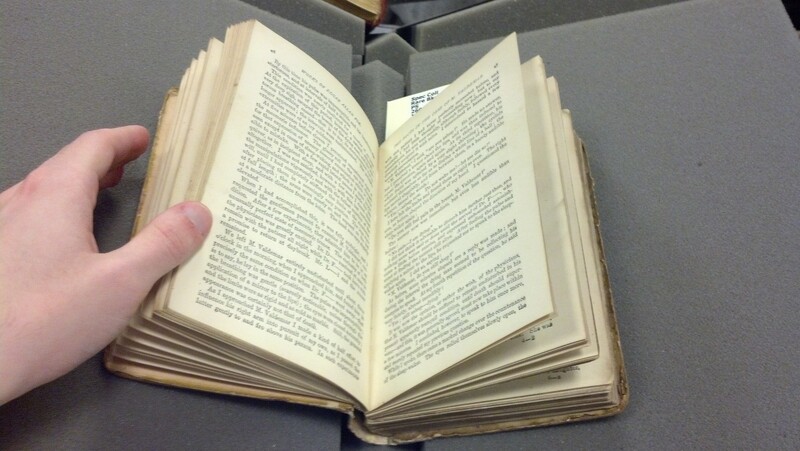 Unfortunately, the low quality of materials caused the binding to be flimsy and the paper to become brittle and flaky, as can be seen here. Yellowbacks produced after 1870 were especially low quality, which ultimately led to their replacement by large paperback novels. Another goal of the yellowback was to utilize enthralling cover pictures and racy content to convince people to read it. 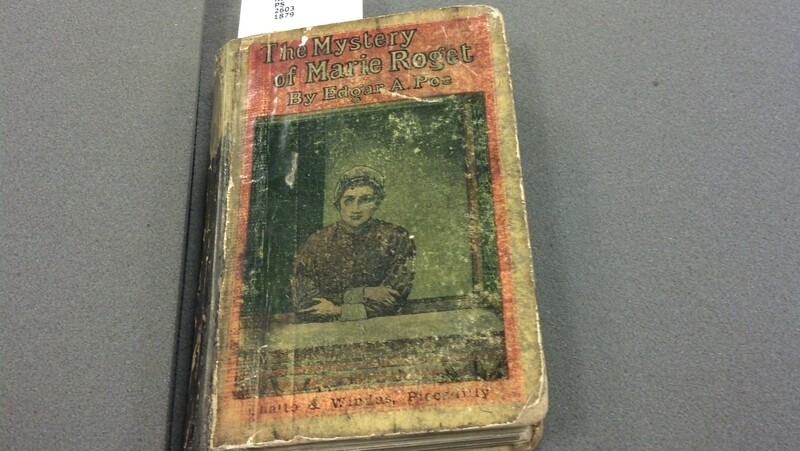 The Mystery of Marie Roget was written by Edgar Allan Poe in 1842 and is the first murder mystery novel that was based upon an actual crime. The true murder created a lot of controversy, so Poe hoped to create interest by writing a murder mystery similar to the real case. He even went so far as to ”solve” the murder, which remained unsolved in real life, likely hoping to intrigue readers more.